Rested and content after our sojourn on Hinchinbrook Island, it was time to put in some northerly miles. We were experiencing no wind at all, but we assumed that it was still blowing out to sea. A few hours later, we poked our nose out around the northernmost tip of the island and picked up a lovely nor’easter that had us flying along towards the next set of islands, the Family Group. As dusk fell, we came abeam of the resort island of Dunk. We passed into its wind shadow, and never came out. The wind had died completely. I downloaded some GRIB files and found that the forecast was for no wind at all for the next few days. We considered anchoring at Dunk, but felt that we hadn’t really made any progress – Hinchinbrook was still in sight – so we decided to motor for a few more hours and anchor off the Barnard Group instead. We arrived at the North Barnard Islands after dusk but before moonrise. It was very dark indeed. We slipped into our usual anchoring routine of one of us on deck steering with night-accustomed vision and the other down below watching the GPS and chart and calling up course adjustments. We knew from the chart that we were rounding Kent Island at a distance of a few tens of metres, but we could barely make it out as we slipped between it and an equally invisible breaking rock. When we got into the reef between Kent and neighbouring Jessie Island, we found another yacht already there, thankfully with anchor lights correctly lit, but there was room enough for both of us. A mild but continual beam swell made for a restless night, but the morning brought no wind so we took it easy. While standing on deck admiring the scenery, I spotted a derelict old dugout canoe floating towards us. I got out the binoculars (a bird-watching present from my parents when I was about ten; who’d have thought then that one day I’d be using them on a yacht in the Pacific?) to have a closer look, but there didn’t seem to be anybody aboard. 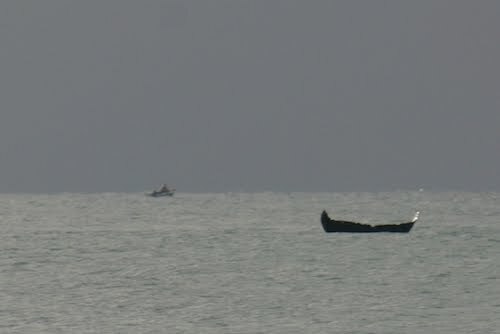 As I watched, the canoe vanished and then reappeared, and I suddenly realised that it wasn’t a boat at all but the tail flukes of a whale hanging head-down in the water. It was pretty shallow, so I can only assume that it was resting with its head on the bottom. There was still no wind. I attempted to update the blog, but found that I only had one bar of signal. This was an excellent chance to test out the antenna that we’d bought in Townsville. We hadn’t been able to source either a mount or a patch cable to attach it to the modem, but I’d knocked something up using copper wire, aluminium foil, gaffer tape and string. It all worked perfectly, first time, with four bars of broadband. Not a bad upgrade for $100. While washing up after a leisurely brunch, we felt a faint zephyr of a breeze and realised that there was a distant rain squall marching across the horizon. Guessing that we were on the edge of a small weather system, we quickly cleared the boat for sea and set up the sails for the anticipated sou’wester. It did come, but it came slowly, drifting us along at only a couple of knots. For the rest of the day the squall stayed stubbornly on the horizon and refused to come closer, so that in order to make any headway we had to sail wing-on-wing in the light breeze. This entails keeping the main sail hovering on the edge of a gybe and flying the jib on the wrong side, which takes a bit of concentration when you don’t have a pole to stop the jib from collapsing. In the end we pulled in the foresail and let Harriet bimble us along at 3 knots on the main alone. As evening drew in, even that little breeze dropped and we started the motor. We were a little low on fuel, and dislike motoring at night, so we decided to hide behind nearby Normandy Island, one of the Franklin Group. The last dying rays of dusk allowed us to spot a couple of other yachts and some other mysterious floating objects through the binoculars before we arrived in full dark, which was just as well because when we arrived they were largely unlit. One yacht was showing an anchor light, but a large cat which really should have known better had only hung out a handful of dim little garden solar lanterns. There were also two vessels belonging to the Cruise Franklin company, one with a single solar lantern that ran down its batteries and went out as we watched, and the other completely dark and which we were lucky not to run down. We had hoped to get some shelter from the SE swell, but in the event it parted around the island into two streams which hit us simultaneously at 90 degrees to each other, rolling and pitching at the same time. We made the best of it until 3 am when it all died down and we were able to get some proper sleep. The next morning brought the lightest of winds again, and in the end we motor-sailed the last stretch into Cairns. Where are the famed continuous trade winds when you need them? This entry was posted in Australia, Oceania, Travel, Voyage of Pindimara and tagged Sail on 2009/08/13 by Reinhard.